We noticed most party rental companies don’t really mention anything about themselves. Their websites resemble straight e-commerce sites, just product and price. While we are very proud of our products and our competitive prices, we also think the people running the business matter. 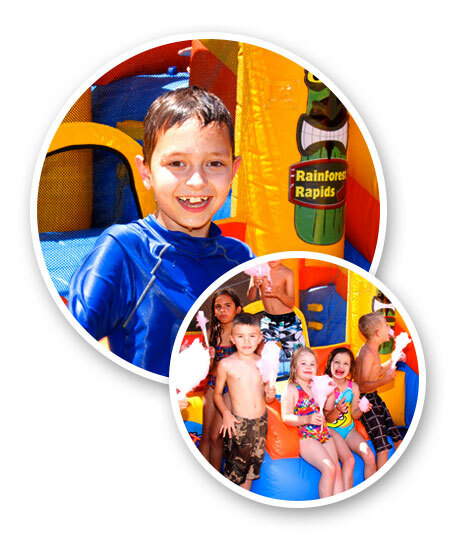 We think it matters who you are trusting with the safety and happiness of the kids at your event. We think that since you are on this page, it matters to you too. If there is anything else you’d like to know please give us a call or shoot us an email. We are a family-owned and operated business based out of Surprise, Arizona. 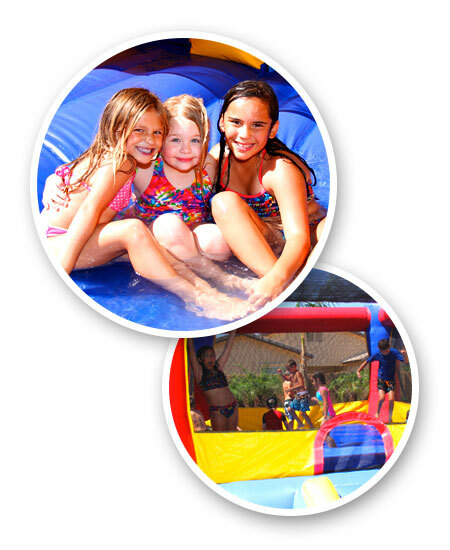 We provide bouncy houses, combo units, wet and dry inflatable slides, treat machines, and most everything in between for rental. We have three small children ourselves and understand the importance of making our kids happy. 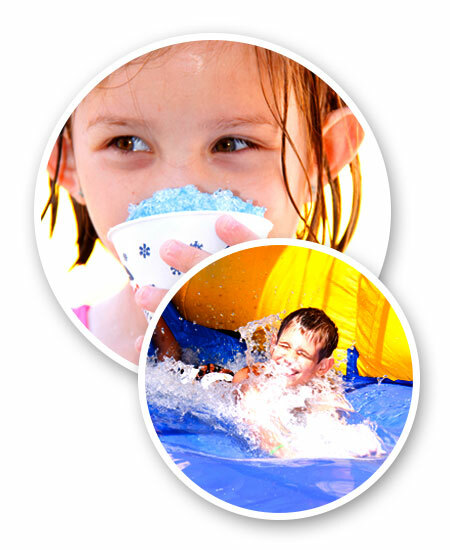 We know that organizing and operating a special event for children can be hectic to say the least. So, we are here to provide you with amazing service and quality products to ensure that your event is an experience like no other. If you live within our standard delivery zone there is NO delivery charge or extra fees for a paid inflatable rental. The price listed is the only price you’ll have to pay. If you are a contest winner or a non-profit getting a free inflatable rental we do require a $25 delivery charge to cover gas and employee costs. If you are located in our extended delivery zone there is a $10 additional delivery charge added to any rental. We decided to get into the inflatable rental business after going through the process of finding and hiring a company for our daughter’s birthday. We spent weeks searching through websites, reading reviews, contacting companies, and researching. We were rather shocked at how poor looking websites and logos were, how grammatically incorrect and misspelled verbiage was, how often links were broken, how outdated content was, and how hard it was to find the information we were really looking for. We thought, we could do this and do it better. Once we began contacting companies we were amazed at how often we got personal cell phone voicemails or people just answering “hello”. It didn’t feel like we were calling a legitimate business, just some guy. Lots of calls and emails weren’t returned in a timely manner. Once we finally hired a company the guy just delivered the inflatable out of the back of his pickup wearing plain clothes. He was almost an hour late. He was cordial, but certainly not overly friendly, enthusiastic, or helpful. He was supposed to pick the inflatable back up at 8 pm and didn’t return till 2 am, letting himself into our back yard and waking us up. We thought, we will do this and do it better. We ended up spending $325 on a water slide, and while the slide itself was fantastic and the kids LOVED it, everything else about the experience left a bad taste in our mouth. Now we’ve turned our love for kids, our love for throwing parties, and our desire to do this business the way we feel it should be done into Leaps Abound. As inflatable owners and operators, we realize just how much fun that they can be. However, we also want you to know that our number one priority is the safety of your children. So, to do our best to ensure that each and every participant is happy and safe, we have become certified through SIOTO (Safe Inflatable Operators Training Organization). You may visit their website and verify our Advanced Certification Credentials here. We are one of only two companies in the phoenix area to receive the advanced certification. Rest assured that after the setup of our equipment, we will go over the operational steps and ensure that you are informed of the safety precautions as well. When you rent equipment from us, we guarantee that each item has been thoroughly inspected, cleaned, and sanitized prior to its arrival. All of our equipment is less than a year old, and it is meticulously kept. In any case, we keep back-up blowers and bouncers on hand at all times in case of an emergency. There will be no spoiled events on our watch if we can help it. We only buy the best. Even our extension cords and hoses are top of the line commercial grade. We never skimp on quality. 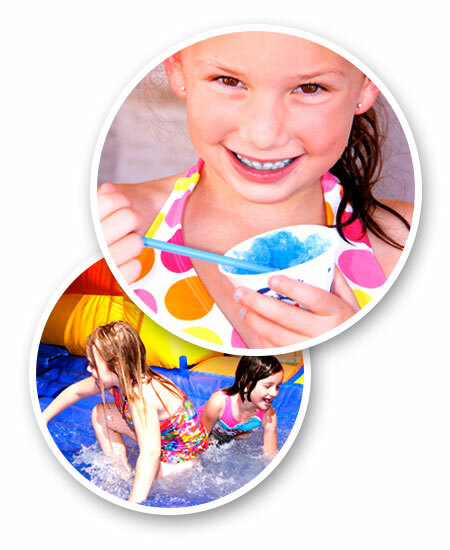 Renting a Sno-Kone machine from us? Don’t have the time to purchase ice or the space to store it? We will take care of it for you. Upon request, we will bring the ice needed for the machine along with a cooler to keep it frozen until it is needed. Worried about not having a hose long enough to reach the water slide you would like to rent? 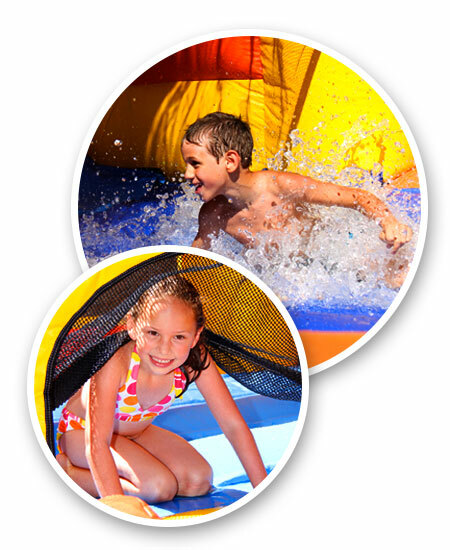 Well, worry no more, as we provide all of the necessary equipment with each one of our inflatables. 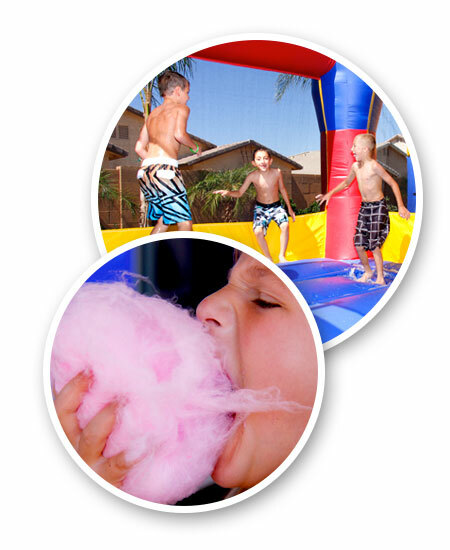 Use Leaps Abound for your party rental needs, and all you will have to provide are the kids. Fun included at no extra charge. We want you to know that we are willing and able to do pretty much whatever it takes to make you happy and make your event a success. Please don’t hesitate to ask because we are always willing to help figure it out with you. Your complete and total satisfaction is our number one goal each and every time. In terms of goldilocks, we consider our company just right. We’re not TOO big. We aren’t so large of a company that you are going to be dealing with employees with no ability to work with you and be flexible. Every time you call you’ll be dealing directly with the owners. We’re not TOO small. This is a full-scale, full-time business and we run it as such. Unlike a lot of inflatable rental “companies” we aren’t just some guy with a pickup and a couple used bouncy houses in the garage that he rents out on the weekends. We really truly love this business. It is hard work but we enjoy it. That means you’ll always be dealing with someone that is happy, cheerful, and helpful, not just some underpaid employee that wants to get done as soon as possible and go home. You’ll notice what a difference that makes. Before you rental please ensure that the space where the inflatable is being setup and the path to it is clear of debris and impediments. One or two Leaps Abound employees will show up promptly at your delivery time. We will knock on the door and give you the rental agreement for you to review and sign while we go through our setup process. Once you show us where you would like everything we will lay out a tarp and stake it down with small stakes. We will then bring in and unroll the inflatable and set up the cord and blower. At that point we’ll let the child of honor push the button to initiate inflation. Then 70 lb sandbags are brought in and attached to the inflatable for safety. Finally the inflatable will be vacuumed or wiped down if necessary to clear any incidental dust or debris from transport. We’ll add balls to the ball pit or setup water features if those were included. If you rented any concession equipment, tables, or chairs we will set those up for you as well. At that point we will walk you through the operation and safety instructions and have you inspect everything. When setup is finally complete we will require the remaining balance, if any, and the signed agreement and liability documents. The entire process takes a half hour to an hour depending on what is rented. During your rental Leaps Abound employees will be readily available if you have any questions or concerns. We ALWAYS have backup blowers and inflatables at the ready if anything happens with your equipment. No party will ever be ruined on our watch! At the scheduled completion of your rental one or two Leaps Abound employees will show up and knock on your door. If you would prefer we call or text because little ones are sleeping, or you’d like us to go into your yard and begin takedown without knocking please let us know ahead of time. We will inflate the inflatable to check that it is in the same condition as it was left. We then will vacuum it out and wipe it down with disinfectant. Afterwards we will roll the inflatable and remove everything form your yard. The entire process takes an hour to an hour and a half depending on what is rented. “This was so much easier and more fun than the chuck e cheese party we had last year. All the parents got to relax and watch the kids play. The following forms are required to be read and signed by an adult who will be on-site and responsible for the duration of the rental. We will email them out a few days before a rental and have a hard copy to be signed the day of delivery. However, if you would like to read them beforehand they are available below.